for water on the way! 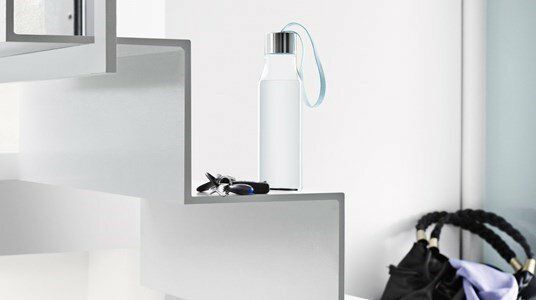 The Eva Solo Drinking Bottle enables you to maintain your fluid balance, even on the move. Your drinks will stay pure, and the environment is protected from all the countless disposable bottles which are daily discarded. A simple yet appealling bottle always at hand! Thanks to its practical strap it is easy to spot it in your bag, it is 100% watertight and very robust. This bottle is funnier just by the colour of its strap. 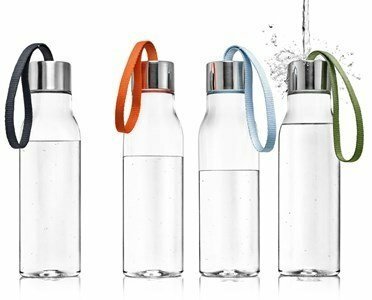 The bottle is dishwasher-safe while the screw-top lid should be washed by hand. Made of plastic which contains no bisphenol A (BPA Free), phthalates or heavy metals. Keep your hybrid balance in style!